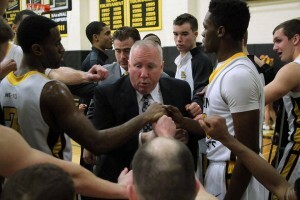 One of the most decorated college basketball coaches in the country, Brian Beaury has steadfastly developed a program that garners the utmost of respect from every corner, on every level of the game throughout his 27 years at The College of Saint Rose. Beaury, who is a member of two Halls of Fame, has continually left an indelible impression upon a group of young men whose predecessors not only continually surpassed all expectations, but also provided the College an avenue for national recognition. “We have been very fortunate to have had great coaches and great players throughout the years. We have found a formula that works for us at Saint Rose. One of our goals is to attract players who will fit in with the rest of the College’s student body and who are poised to develop as students, people and as players. We want to develop a relationship where we’ll be their coach for four years and their friends forever,” says Beaury. Beaury, who became just the 34th NCAA Division II head coach to reach the 500-win plateau in 2008-09, has an uncanny ability to instill his knowledge of the game into his student-athletes’ performance. His teams have won an average of nearly 20 games during the last 15 campaigns and have posted at least 20 wins on seven occasions throughout that span. Saint Rose won five consecutive regular-season East Coast Conference (formerly the NYCAC) titles, prior to its entrance into the Northeast-10 Conference 12 years ago, and has been awarded 12 NCAA Tournament bids in its 21 years competing exclusively at the NCAA Division II level. 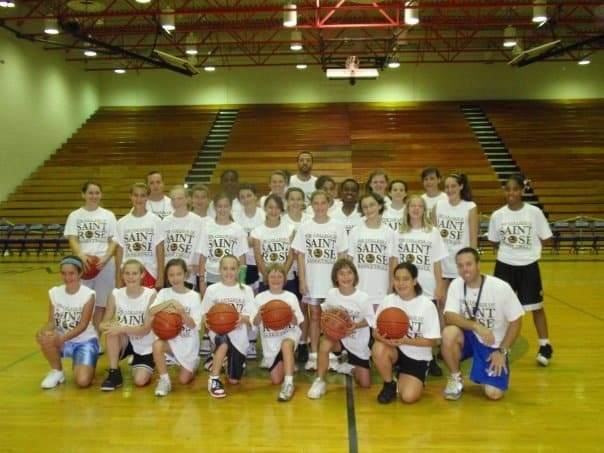 Saint Rose has compiled a 561-247 (.680) record during that time and has captured three NCAA Tournament Northeast Regional Championships on the way to three “Elite Eight” appearances and a trip to the “Final Four” in 1998. Furthermore, the Golden Knights advanced to the ECAC Championship Tournament in four of their non-NCAA Tournament years and came away with titles in both 1993 and 2001. Beaury has furthermore established the Golden Knights as a traditional power within the NE-10, which has sent at least five teams to the NCAA Tournament in seven of the past eight seasons. The 52-year-old mentor has compiled a 561-247 (.689) career record, has earned Coach of the Year plaudits on five separate occasions and was nominated for National Coach of the Year in 1989 when the program was still part of the NAIA. He was furthermore inducted into the New York State Basketball Coaches Hall of Fame in the spring of 2010. Three years ago, Saint Rose honored him by inducting him into its Athletics Hall of Fame. Beaury stood eighth among the nation’s most successful NCAA Division II coaches in terms of victories entering this season. Additionally, his teams have qualified for postseason play in 26 of his 27 seasons and have won eight conference titles. Saint Rose has also played on national television, has had just two losing seasons under his tutelage and has won at least 19 games throughout 21 of his 27 years on the bench. Impressive stuff indeed; but when you’re intelligent, committed, and an outstanding recruiter in addition to being a student of the game; good things are bound to come your way. Beaury, who was Eastern Basketball’s 1998 small college Coach of the Year, is in high demand on the lecture circuit. 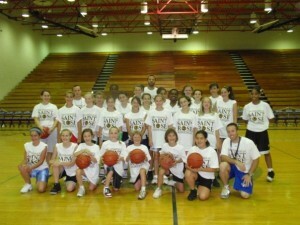 He has spoken at clinics throughout the world including the renowned Eastern Invitational and Five Star Basketball Camps. Beaury has also guided several college All-Star teams on summer tours throughout the world in recent years. He has coached college players on visits to Greece, Turkey, Spain, Cuba, Germany, Dominica, Montserrat, and Antigua to mention a few. He has also guided the Golden Knights on team trips to Spain, Italy, Cuba, Australia, and Fiji. This past summer, Saint Rose toured the Baltic countries of Latvia and Lithuania where they played seven games throughout a two-week period. A native of Queens and one of six children, Beaury played high school basketball at St. Agnes before heading to Saint Rose where he was a four-year letterwinner. He was also the recipient of the College’s 1996 Distinguished Alumni Award. The three-time captain still ranks among the school’s top-10 career leaders in both assists and steals. A two-time All-Conference selection who was the team’s Most Valuable Player as a senior, Beaury entered the collegiate coaching ranks at the tender age of 21 when he landed the assistant’s position at the Junior College of Latham in 1982. Beaury then returned to his alma mater in 1984 and two years later was named the College’s second head coach. The rest you now know about. He was the founder of the Saint Rose Summer Sports Academy and is also the founder of the aforementioned New York State Basketball Coaches Association Hall of Fame. Furthermore, Beaury was actively involved with the development office as co-chair of two different capital campaigns for Saint Rose. Beaury earned both his bachelor’s degree in business administration and his master’s in education from Saint Rose. He is taking a break from his M.B.A. studies at the College so he may spend more time with his family. He resides in Cohoes, NY with his wife, the former Mary Ann Grennon (Saint Rose ‘82), also a member of the Saint Rose Athletics Hall of Fame, and their three children; Alexandra, Brian and Benjamin.